Welcome to the Strategy Execution Institute®. 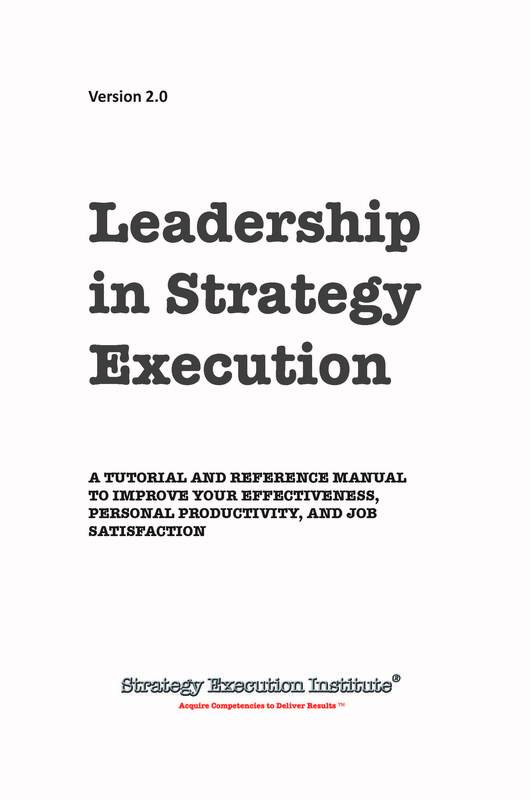 Our popular training program, Leadership for Strategy Execution™, is now available in the iPad, Hardcover, paperback, and Kindle formats. To succeed in a fast paced work environment, you need to display leadership behaviors, on demand. This book will help you build leadership skills in a step by step manner. The payback is huge: you will systematically and progressively increase your effectiveness, personal productivity, and job satisfaction. The guidelines in this book have been field tested and fine tuned over several years in the workplace. You will learn how to apply the research-based teachings in this book to your workplace situations and become the best you can be. Everyone in the workplace, at all levels, needs to display leadership behaviors. If you are an emerging leader, use this book to fulfill your duty and responsibility to develop leadership behaviors in yourself. If you are an accomplished leader, use this book to coach and mentor a co-worker. If you are a senior executive looking to build your organization’s leadership bench, use this book to foster leadership behaviors in your organization. The ultimate benefit: find happiness and become the best you can be at work.